Kinetics is the study of the rate at which reactant molecules are converted to products in a chemical reaction. Equilibrium refers to the fact that reactions are reversible; products can be converted back to reactants. As this chapter will show you, no matter how often you may see the terms used together, these are two fundamentally different concepts. Some specific topics covered in this chapter are rates of reaction, equilibrium and Keq, and Le Chatelier's principle. Kinetics is the study of the rates of reactions—;the speed at which reactants are converted into products. Equilibrium is defined as the point in a chemical reaction at which the concentration of all the reactants and products ceases to change. As we will show you, no matter how often you may see the terms used together, these are two fundamentally different concepts. The rate at which reactants are converted into products in a reaction is called the reaction rate. Remember that chemical reactions involve breaking old bonds (in the reactants) and making new bonds (in products). In order for bond breaking and bond making to occur, reactant molecules (or atoms or ions) must collide with sufficient energy and proper orientation. Why are energy and orientation important? Well, the reactant molecules need to collide with enough kinetic energy to break their bonds, and they need to collide with the proper orientation for new bonds to form. Consider the gas phase reaction. Notice that if an H2 and I2 molecule collide with enough kinetic energy and in the orientation shown below, the atoms are in an ideal position to form new H–I bonds. First: Reactant molecules H2 and I2 move toward each other with sufficient energy. Next: The collision causes H–H and I–I bonds to begin to break. Since the reactant molecules were properly aligned, new H–I bonds also start to form. The above species is an extremely unstable, high-energy arrangement of atoms called an activated complex or transition state. Reactants must form an activated complex before products can be made. Finally: H–H and I–I bonds are completely broken, and H–I bonds are formed. The chemical reaction has produced hydrogen iodide. Although this was a somewhat simplified account of what actually happens during a chemical reaction, the actual process does involve molecular collisions, bond breaking and making, and the formation of an activated complex. The test writers will expect you to be familiar with several key factors that influence the rate of a reaction. All of these factors impact the reaction rate by affecting the rate of molecular collisions, the energy of the collisions, or both. Concentration of Reactants Reactant molecules must collide in order to form products. If the rate at which reactant molecules collide is increased, then the reaction rate will also increase. One way to increase the rate of reactant collisions is to increase the amount of reactant present, or in other words, to increase the concentration of reactants. For example, wood burns much faster in a pure (100 percent) oxygen environment than in air (which is only about 20 percent oxygen by mass). An increase in the concentration of the reactant oxygen causes an increase in the rate of combustion. However, this is true only of reactants that are gaseous or in solution, whose concentrations can be changed. For instance, a gas can be compressed into a smaller volume (increasing the concentration of gas molecules per volume). Since the molecules in a pure solid or liquid are relatively close together, they cannot be significantly compressed, so their concentration is essentially constant. To sum up: If one or more reactants are gaseous or in solution, the reaction rate can be increased by increasing the concentration of those reactants. Obviously, a decrease in reactant concentration will produce a decrease in reaction rate. If the reactants are in gaseous phase, then increasing their pressure will also increase their concentration, thereby accelerating the reaction rate. Surface Area of Reactants The greater the surface area of the reactants, the greater the number of collisions; hence the faster reaction rate. For instance, a cube of sugar will dissolve less quickly in water than will the same amount of sugar in loose form. Only the surface areas of solids and liquids can be changed: We can increase the surface area of a solid by breaking it up or grinding it into a powder, and a liquid's surface area can be increased by spraying it out as a mist of fine droplets. Temperature The factor that has perhaps the most profound effect on reaction rate is temperature. This is because a temperature change affects both rate of reactant collisions and the energy involved in the collisions. Remember that temperature is a measure of the average kinetic energy of molecules. As the temperature of the reactants is increased, the molecules move around faster; this results in more frequent and energetic collisions and increases the likelihood that a given collision will have sufficient energy to break bonds. A good rule of thumb says that for every 10°C increase in temperature, the reaction rate will double. Nature of Reactants Since bond breaking is part of the reaction process, it makes sense that reactant molecules composed of weaker bonds will react more quickly than will reactant molecules held together by stronger bonds. Reactions between dissolved ions tend to be rapid, since bond breaking has already occurred, with the dissolution of the ionic substance. Catalysts A catalyst increases the rate of a chemical reaction without being consumed by it. Enzymes are examples of catalysts. They are involved in many important biological reactions. How do catalysts accelerate reaction rates? Before we get to that, let's first consider the energy changes that occur in the course of a reaction. This figure is sometimes referred to as a potential energy diagram. 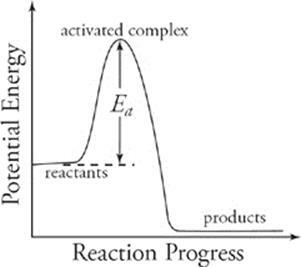 The potential energy of the activated complex is greater than that of the reactants, and the energy difference between the two is called the activation energy (symbolized as Ea ). The activation energy is the minimum energy that must be supplied for the activated complex to be formed. It is an energy barrier that must be overcome by reactant molecules; reactant molecules acquire the necessary activation energy by absorbing heat from the surroundings. The size of the activation energy barrier indicates how difficult it is for the reaction to proceed. A relatively small barrier, indicating a low activation energy, means that collisions between reactant molecules need less energy to produce an activated complex. Thus, a greater percentage of reactant collisions is likely to lead to product formation, resulting in a relatively high rate of reaction. Let's return to the question How do catalysts work? Catalysts increase the reaction rate by enabling the reaction to proceed through a series of different steps, with a lower activation energy, than they ordinarily would. So a catalyst reduces the minimum energy requirement of the reaction. This leads to a greater percentage of product-forming collisions and thus an increased rate of reaction. Since a catalyst is not consumed by the process, a small amount of catalyst can be used to speed up a reaction with a fairly large reactant concentration. Catalysts increase rate of a reaction by lowering the activation energy. Catalysts are not consumed in a reaction. Catalysts do not change the equilibrium of a reaction. The rate of reaction depends on both the frequency of molecular collision and the energy of molecular collision. We've been talking about chemical reactions as if they occur in only one direction—;from reactants to products. What do the two arrows mean? They mean that the reaction is taking place in both directions. Reactants are forming products (the forward reaction), and products are forming reactants (the reverse reaction). Let's talk about how this works. When a reaction first starts, the concentration of the reactants is high, and the concentration of the products is very low. At this point, the rate of the forward reaction is greater than the rate of the reverse reaction. After a while, as more of the products are formed, less of the reactants are present. Ultimately, if pressure and temperature are maintained and the system is closed (meaning no species are allowed to escape), the rate of the reverse reaction will be equal to the rate of the forward reaction. In other words, reactants are being made as rapidly as are products. When this occurs, we say that the reaction is in equilibrium, or dynamic equilibrium. When a reaction is in dynamic equilibrium, the forward and reverse reaction rates are equal, which also means that the concentrations of products and reactants are constant. But here's what equilibrium definitely does NOT mean: It does not mean that the concentrations of products and reactants are equal. It just means that whatever the concentrations of products and reactants may be, they aren't changing once the reaction reaches equilibrium. If we want to know about the relative concentrations of products and reactants of a reaction at equilibrium, we must know two things: (1) the reaction's equilibrium constant, or Keq, and (2) the reaction's equilibrium expression. Keep in mind that the concentrations referred to in an equilibrium expression are those of the species at equilibrium; the coefficients in the balanced equation become exponents in the equilibrium expression; and only those species whose concentrations can be varied are included. So, only species that are gaseous or in solution (and not solids or pure liquids) belong in an equilibrium expression. Take a close look at the above equilibrium expression. Notice that the equilibrium constant Keq is proportional to product concentrations over reactant concentrations, or . What's the significance of that ratio? Suppose that in a particular reaction, almost all of the reactants are converted into products and that products do not reform reactants to any great extent. How would the Keq of the reaction reflect such behavior? Well, product concentrations would be much greater than reactant concentrations at equilibrium. As a result Keq, which is roughly a ratio of product concentrations to reactant concentrations, will be a relatively large number (greater than 100). If, instead, we have a reaction in which reactants form relatively little product, then Keq will be relatively small (smaller than , or 1 × 10–2). If product and reactant concentrations at equilibrium are somewhat close, then Keq will be close to 1 (not particularly large or small). So the value of the equilibrium constant Keq of the reaction can give us a good idea about the extent to which reactants form products. Solvents (usually H2O) are not included in the equilibrium expression. Each concentration is taken to the power of its coefficient in the balanced equation. Dynamic Equilibrium—;Rate of forward reaction equals rate of reverse reaction; constant but not equal concentration of products and reactants. The principle of equilibrium does not only apply to chemical reactions but also to any system in which one thing is transforming, reversibly, into another—;such as a phase change, for instance. Remember vapor pressure? Suppose water is in a sealed container, at a temperature below water's boiling point; some molecules will still gather enough kinetic energy to escape from the liquid and become gas. Then they will lose their kinetic energy—;they will cool down and fall back into the container as water. Other liquid molecules gain enough kinetic energy to escape into the gas phase, and the process continues. Some liquid is converted to gas, and some gas is converted to liquid. The process is in equilibrium. On the left side of the equilibrium equation, we find A and B. On the right side, we find C and D. A and B act together to produce C and D; meanwhile, C and D act together to produce A and B. If we add more A to the reaction system, the reaction will shift to the right, to produce more C and D at equilibrium. If we add more B to the reaction, the reaction will shift to the right, to produce more C and D at equilibrium. Adding more A and B, of course, will also increase the production of C and D.
Adding more C or more D to the system has an analogous but opposite effect. Think about it this way. When you add more A to the system, you're increasing the amount of reactant available to react and form products. Similarly, if you add more C or D to the system, you're increasing the amount of product available to react and form reactants. The system will adjust by moving to the left to reestablish equilibrium. When we increase the concentration of one species on the left side of an equation, what happens to the concentration of the other species on the left side of the equation? Say we add more A to the system: There will be more collisions between A particles and B particles. Since we did not add any B to the system, the increased collisions among A and B particles, along with the increased production of C and D, will tend to reduce the concentration of B at equilibrium. After equilibrium has shifted, there will be more A particles than there were before we added any more A. There will be fewer B particles than there were before we began, and there will, of course, be more C and D particles. To give you an idea of what we mean by “driving or shifting equilibrium to the right,” consider this example. Suppose for the reaction, 2A(g) + B(g) C(g), equilibrium concentrations at a particular temperature are [A] = 2 M, [B] = 6 M, and [C] = 8 M.
When we plug these into the equilibrium expression Keq = we get Keq = . Now, according to Le Chatelier's principle, if we add more A into the system at equilibrium, equilibrium will shift to the right. So once equilibrium is reestablished, the concentration of C will be greater than 8 M, and the concentration of B will be less than 6 M. Of course, the concentration of A will also be greater than before. But as long as we maintain the original temperature, Keq will stay the same. So when the new equilibrium concentrations are plugged back into the equilibrium expression, it will still equal . For instance, the new equilibrium concentrations could be [A] = 3 M, [B] = 4 M, and [C] = 12 M. The equilibrium concentrations have changed, but the Keq has not. The reaction consumes heat in the forward direction, and it produces heat in the reverse direction. In a sense, you can think of heat as being one of the reactants in this equation. So what happens if we increase the temperature of this reaction? That is, what happens if we add heat to the system? According to Le Chatelier's principle, we drive the equilibrium to the right. What happens if we decrease the temperature of the system? We drive the equilibrium to the left. There is one important thing to know about temperature changes: This is the only type of stress that causes an equilibrium shift and changes the value of Keq for a given reaction. The others do not alter Keq. If some stress is placed on a reaction at equilibrium, then the equilibrium will shift in a direction that relieves the stress. If one or more of the species in the reaction are gaseous, then changing the system's pressure can affect equilibrium. Consider the important ammonia-producing reaction that is at the heart of what is known as the Haber process. If the above reaction at equilibrium is stressed by a reduction of its volume (which would increase the pressure of the system), then the reaction will relieve this stress by shifting equilibrium in the direction that produces fewer moles of gas. Therefore, in the above reaction, equilibrium would shift to the right. If the reaction system was stressed by an increase in its volume (which would decrease the pressure of the system), then equilibrium would shift to the left. The equilibrium of a reaction that involved equal moles of gaseous reactants and products would not be affected by either a change in volume or a change in pressure. So how does the presence of a catalyst affect equilibrium? The answer is simple: It doesn't. Catalysts change reaction rates, but they do not affect equilibrium. A catalyst can aid the reaction in achieving equilibrium more quickly, but it won't affect the concentration of product at equilibrium. This emphasizes what we said at the start of this chapter: Kinetics and equilibrium address quite different aspects of a chemical reaction. As you learned in the last chapter, some combinations of cation and anion form ionic solids with very low water solubilities or precipitates. However, even the most insoluble ionic precipitate dissolves into ions in water to a certain degree. If pressure and temperature are maintained for a precipitate in water, equilibrium exists between the precipitate and its dissolved ions. For instance, consider the equilibrium between the precipitate lead chloride (PbCl2) and its dissolved ions. Remember that solids are not included in equilibrium expressions! When we consider equilibrium between a so-called insoluble ionic solid and its dissolved ions, we call the equilibrium constant a solubility product constant and symbolize it as Ksp. As you might expect, since the forward reaction is so insignificant for these precipitates, Ksp values are typically very small. For PbCl2 at 25°C, Ksp = 1.6 × 10–5 (or 0.000016). The smaller Ksp is for a given ionic solid, the more insoluble it is. Review everything we've said about kinetics, reversible reactions, and equilibrium; then answer the following questions. Answers can be found in Part III. 53. In comparing the two reactions above, performed at the indicated temperatures, which of the following is true? (A) Reaction 1 is favored in the forward direction, and reaction 2 is favored in the reverse direction. (B) Reaction 1 is favored in the reverse direction, and reaction 2 is favored in the forward direction. (C) Both reactions 1 and 2 are favored in the forward direction. (D) Both reactions 1 and 2 are favored in the reverse direction. (E) Neither reaction favors either the forward or reverse direction. 58. Which of the following statements is NOT true regarding the activated complex? (A) It represents the highest energy state achieved during the course of a reaction. (B) It is not consumed during the course of a reaction. (C) It is very unstable. (D) It is formed before reactant bonds are completely broken. (E) It is formed before product bonds are completely formed. · Rate of reaction is the speed at which reactants are converted into products. · Rate of reaction is affected by the concentration of reactants in solution, surface area of solid reactants, temperature, the type of reactants involved, and the presence of a catalyst. · A catalyst lowers the activation energy, or the amount of energy each reactant molecule needs to be converted to a product. · Catalysts are never consumed during a reaction. · Dynamic equilibrium refers to the fact that for a given system, reactants can be converted to products, and products can be converted back to reactants. When the concentrations of the reactants and products are such that the rate of the forward reaction (reactants to products) equals the rate of the reverse reaction, the system is in equilibrium. · Le Chatelier's principle states that stressing a system at equilibrium causes the system to shift to relieve the stress. · Adding more reactants or removing products shifts the equilibrium to the right. Adding products or removing reactants shifts it to the left. · Adding heat to an endothermic reaction shifts the equilibrium to the right. Adding heat to an exothermic reaction shifts it to the left. · Adding pressure by reducing the volume of a gaseous reaction shifts the equilibrium to the side with fewer moles. · Catalysts have no effect on equilibrium.